Plantronics HW540 Headset - Headsets Direct, Inc. 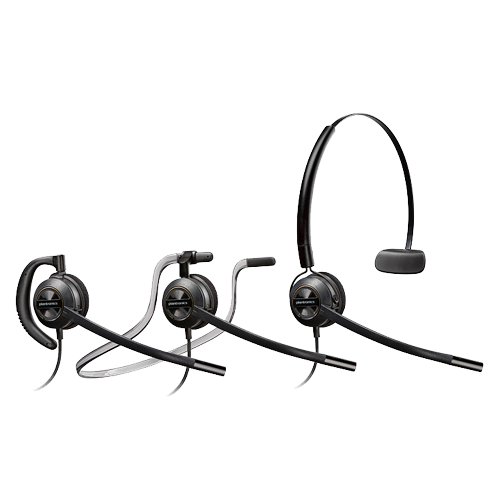 This is a short introduction to the Plantronics EncorePro HW540 corded convertible headset. The term convertible in the title means you’re getting a headset that you can wear different ways, so it’s the same headset, but it comes with three different wearing pieces. You can configure the HW540 headset to wear it three different ways; over the ear, over the head, or behind the head. To wear it over the ear, you use the included ear loop. The ear loop is bendable and flexible, so you can get a really good fit specifically for your ear. The headset has a soft, foam ear cushion that rests against your ear. The headset is easy to change from one wearing style to another one. If you want to wear it over your head, you just pop off the ear loop and snap the headset into the over-the-head headband. The headband is adjustable and has a soft temple pad to keep it in position all day. If you decide to try the behind-the-neck option instead, just pop the headset out of the headband or ear loop and pop it into the behind-the-neck band. If you’re new to headsets, the HW540 convertible headset is a good option, because you get three different ways to wear the headset, so you’ll ultimately find one style you like better, and not have to fuss with trying and returning headsets until you find the right fit for you. It also works well in an environment where you share headsets, where different users have different preferences. So having three different pieces, you can swap the headset out in a matter of seconds and find the perfect fit for everyone in your office. The Plantronics HW540 headset is made for the average-to-quiet office environment. If you are in a loud environment, you should look at a traditional single ear, over-the-head headset, like the Plantronics EncorePro HW510 corded headset, because that headset has a little bit bigger speaker and gives better separation from outside noise versus what you’re trying to hear. With its little smaller speaker, the HW540 convertible works well in an average-to-quiet office. What you gain is the flexibility of being convertible and a little lighter weight. The microphone is a noise-canceling microphone, and you can flip it to work on either your right ear or your left ear. The microphone bends very easily, giving you good mic positioning, so your caller hears you well. The noise-canceling mic also cuts down on background noise around you, so you’re not having to repeat information to your caller, and they are not getting the wrong information. This headset also comes with a clothing clip, which you clip that onto your shirt or collar. That’s important because the clothing clip becomes the pull point on the cord, so if you pull on the cord, it pulls at the clothing clip, not the headset, and keeps the headset positioned perfectly all day. The last thing to understand about the HW540 is it terminates in what is called a quick disconnect, and that connection is what makes this headset useable in any application. You will need either a bottom cable or amplifier to connect to your device to complete your solution. So before you buy this headset, give us a call, tell us which device you plan to use with the headset, and we will determine which bottom cable or amplifier you need that has the matching quick disconnect for your device. The Plantronics convertible EncorePro HW540 corded headset is a good business-grade headset; very comfortable with great flexibility and sound quality. If you have any questions on this or anything else, give us a call at 1-800-914-7996, or visit us online at www.headsetsdirect.com.